Players are advised to play elsewhere! Sitting way out in cyber space among the stars and planets is a bingo site that is shining brightly. Bingo Vega unites the world together in one big bang of a bingo party embracing players from every corner of the globe. Join the legion of bingo stars at Bingo Vega and soar to new bingo heights. 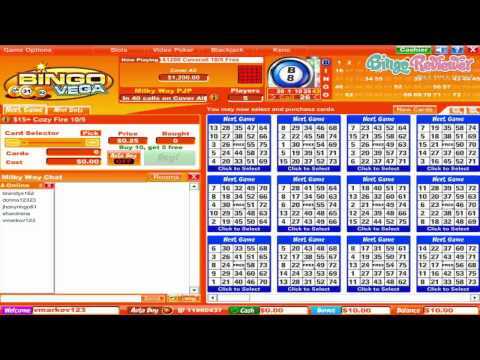 The first thing that will catch your eye is when Bingo Vega was first established. It’s proof enough to validate a site that has passed the test of time. It is no surprise considering the parent site Casino Vega with the massive success that has been generated. The Bingo Vega motto says it all “Big Bonuses, Big Prizes, Big Winners”. Bingo Vega incorporates a well-designed artful site that matches graphics toe to toe for sensational animation. The credit goes to the outstanding software of Parlay Entertainment. They are instrumental in changing the face of the online bingo community with products that are exceptional. The bingo community includes Player Testimonials, Player Gallery, Facebook and Twitter accessibility for a well-established social network. The Newsletter boasts the latest promotions and current events that are kept up to date on a monthly basis. 90 ball and 75 ball bingo are available in a multiple bingo rooms with ticket prices that vary to fit the low roller and high roller players. Bingo Vega is no stranger to offering huge Progressive Jackpot bingo games as well as special exclusive offers with mega cash prize pools. The bingo schedules games to include every style of player including the morning, lunch and late night players. Because most players extend beyond the bingo rooms, there is a full casino with plenty of games to keep players happy with a variety of gambling up for grabs. Video Slots have unique slots not commonly available that are refreshing and new complete with special features including Bonus Rounds, Free Spins and Jackpot wins. One line, 5 line and 9 line Slots are also available. Video Poker has a large collection of choices with Blackjack, Roulette, Instant Games and more to keep all players happy with gaming options. Bingo Vega offers a Free Trial to all new players and it is important to note that it is exactly as the name implies and not a No Deposit Bonus. Though players cannot collect wins it is ideal for a test run of the games before making a deposit first. Once you have experienced Bingo Vega and all they have to offer a sweet Bonus on your first deposit is offered. A Free Bingo room is available for players to win real cash prizes with no out of pocket expense. Bingo specials include BOGOF games and Guaranteed Jackpots. Social interactive games include Chat Games where players are awarded prizes, Team Bingo and Tournaments for Bingo and Slots offering big cash prize pools to the top players. The promotions page is filled with brilliant exclusives and events for a fun playing experience. The Loyalty Program is one of the best offering players’ benefits that are exciting with exclusive Bonuses, Monthly Free Rolls, Player Appreciation and much more. A large bingo community is welcomed to join including players from the USA. We rate Bingo Vega with 5 Pink Hearts. I played the $10 free trial and liked the new mini slots. I've been a long time player at Bingo Vega and have always enjoyed playing at their site. Bingo Vega is one of the first online bingo sites I was able to make a withdrawal from, and it's still exciting to remember to this day! They have a large selection of Parlay slot games, which I enjoy considerably. They also have the new BetonSoft mini and full sized slot games. Many of these feature a jackpot and boy, it would be nice to win one of those! The chat hosts at Bingo Vega are among my favorites and are truly nice folks. I like playing chat games here because they offer some really special games where it's pretty easy to load up on bbs even when you are maxed. Any time that there has been a problem the chat hosts are ON it right away, interacting with support to help the players resolve whatever issues have arisen at the time. It's nice to have someone to stick up for the players. Their support ticket method for contacting them works very well and their support team is fast and accurate. They always take time to explain anything you may not understand, and are pretty good at referring your questions, if needed, to the appropriate staff. The bonuses and loyalty program are really great also, with VIP players being rewarded with nice bonus plans during the week. Top that off with their great promotions, and you've got a site that provides you with everything you need for an enjoyable and profitable bingo excursion. Good luck to all players and be sure and use the signup bonus offered here and please post some nice examples of your winnings at Bingo Vega. I really like this site! The layout is a little boring, but at the same time it’s very clear and concise. They give a nice little glimpse of what they have to offer right off the bat. They truly offer a nice selection of gaming here. They have over 100 different patterns when it comes to their bingo and rooms ranging from 10 cents to $1. In addition to that, they also have a really great free room. You can never go wrong with anything free! On top of bingo, they also offer slots, mini games, video poker, pull tabs and keno. I found the slots here to be a great deal as well. The jackpots can get way up there and there are some really exciting bonus features. One of my favorites is the Hollywood reels game. It’s just a really fun game and the theme just adds to it! Finally a site with a modern and really appealing look. I find it quite fast for navigation and I managed to find all the important information (like promotions and terms and conditions) in two clicks. I got the advertised $10 bonus (a no deposit bonus) without a problem. What I liked even more is a massive 500% bonus on the first deposit, which is for me way better than accumulating bonus on the first few deposits. There is also a nice loyalty program, and with advancing your loyalty level, you will unlock higher bonuses. Your level will depend on the amount of money you have wagered, so the more you play, the better is for you. There are four rooms opened almost at all times, but you should check the schedule to make sure you don't miss out a favorite game. You can buy your tickets in advance, to book your place. You can’t go wrong with Bingo Vega! This site has been around for a while and I am sad to say that I just recently found out about it. Now, I can’t seem to get enough of it! The welcome offer is noting too special, but I don’t really care too much about that. They start all new players off with a $10 free. This gives you a tiny bit of room to begin playing some of their games for free. That’s not all they start you out with, however. Upon your first deposit, they will tack on an additional 500% bonus. You’ll find the classic bingo varieties here. This includes the favorites 75 and 90 ball. On top of the bingo types, they also host! bingo tournaments in which bingo players can take their bingo gaming to the next level. Plenty of free bingo is offered as well. In fact, players can play the free stuff daily!